FRIDAY, Sept. 12, 2014 (HealthDay News) -- The fatigue many people with multiple sclerosis (MS) experience may actually be a sign of an undiagnosed sleep disorder, according to a new study. Researchers found that sleep disorders, which are more common among people with MS, are often left undiagnosed and untreated. Left untreated, sleep disorders could affect the progression of the disease, as well as affect people's overall well-being, the study authors cautioned. "Sleep disorder frequency, sleep patterns and complaints of excessive daytime sleepiness suggest that sleep problems may be a hidden epidemic in the MS population, separate from MS fatigue," said Steven Brass, associate clinical professor and director of the Neurology Sleep Clinical Program and co-medical director of the UC Davis Sleep Medicine Laboratory in a university news release. MS is an inflammatory disease affecting the white matter and spinal cord. Although the cause of MS is unclear, it is thought to be an autoimmune condition, according to the researchers. Symptoms include vision loss, vertigo, weakness and numbness. Fatigue is also a key symptom of MS. The study, published online on Sept. 12 in the Journal of Clinical Sleep Medicine, involved almost 2,400 people diagnosed with MS. Most of the study participants were women, and most were white. The mean age was 54 years. The participants were asked to complete a survey that included questions about their sleep history, daytime sleepiness, insomnia and restless legs syndrome. Nearly 52 percent of the participants needed more than 30 minutes to fall asleep at night. Almost 11 percent needed medication to help them fall asleep. The researchers found that more than 70 percent of these patients had at least one sleep disorder. Nearly 38 percent of those surveyed were diagnosed with obstructive sleep apnea, almost 32 percent had moderate to severe insomnia and around 37 percent had restless legs syndrome. However, most of the patients with a sleep disorder had not been diagnosed, the study revealed. In fact, only about 4 percent of those with obstructive sleep apnea had been diagnosed by a doctor. "A large percentage of MS subjects in our study are sleep deprived and screened positive for one or more sleep disorders," said Brass. 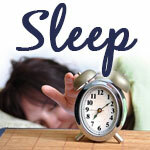 "The vast majority of these sleep disorders are potentially undiagnosed and untreated. This work suggests that patients with MS may have sleep disorders requiring independent diagnosis and management."